I gave it a try and really enjoyed it. After some time had passed, I was at a house gathering where a family member was making Moscow Mules. I got a glimpse into the variety of ways you can create one and figured it was time to throw my hat in the ring. In a large pitcher, add pineapple chunks and fresh cilantro. Pour in vodka and stir for a minute until well blended. Pour in ginger beer and pineapple-coconut juice and continue to stir. Slice the lime in half and squeeze one half of the lime into pitcher and continue stirring until blended. 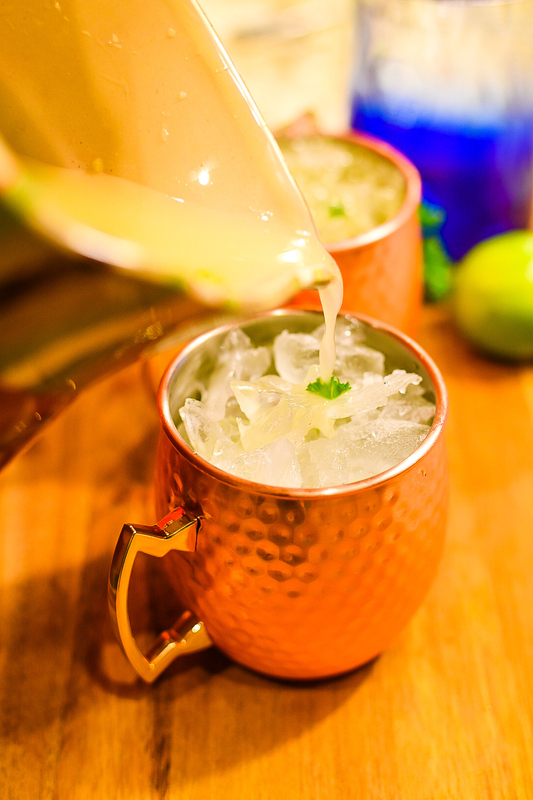 Add ice to the copper mugs and pour pineapple mix. Add a few additional pineapple chunks, if you choose, and top off with fresh cilantro then serve. 0 Response to "Pineapple Coconut Moscow Mule"